A person texting takes their eyes off the road for an average of 5 seconds. At 55 mph, that is the equivalent of driving the length of a football field without looking up. Much has been said about the dangers of distracted driving. While most states in the U.S. have banned texting and driving for all drivers, Missouri lags behind. In Missouri, there is a ban for texting and driving only for drivers under 21 years old. An attempt was made to extend this ban to all drivers in 2015. Again this year, state legislators have heard testimony on a bill that would ban all drivers from texting while driving, except in an emergency. Statistics have proven that texting and driving is a leading cause of car accident injuries and fatalities. Erie Insurance conducted a survey in 2015, which revealed that a third of drivers admit to texting while driving. Most of us have observed drivers on the road, who have one eye on a cell phone screen and another on the road. It is needless to say that these distracted drivers put their lives and others at risk. Each year, as many as 3,000 people are killed and 400,000 people are injured by distracted drivers. According to Virginia Tech Transportation Institute, texting while driving increases the risk of a car accident by 23 percent. Drivers who engage in texting while driving have a slower reaction time than drunk drivers. Studies have shown that teenagers are more likely to text than other drivers on the road. 11 percent of drivers in the age group of 18-20 who caused an auto accident admitted to texting while driving. However, it is a mistake to think that younger drivers are the only ones who text and drive. The population of cell phone users is growing older. A survey by Pew Research Center shows that seventy-three percent of all cell phone owners text. Ten percent of people in the age group of 55-64 years text and this number is rapidly growing. If you were in a car accident because of someone else’s negligent driving, it is important to seek the counsel of an experienced lawyer who has recovered compensation for clients in similar situations. Attorney Christopher Hoffmann is well respected in the legal community and has the skill required to recover the maximum compensation for you. According to a recent study conducted by the Virginia Tech Transportation Institute, when younger drivers use a cell phone while driving, they are more likely to be involved in a car accident. Interestingly, the study concluded that just talking on a cell phone does not increase car accident risks. The new study was conducted among 109 adult drivers and 42 teenage drivers, using surveillance cameras inside the car, a GPS mechanism, and sensors to monitor the activity of the respondents. 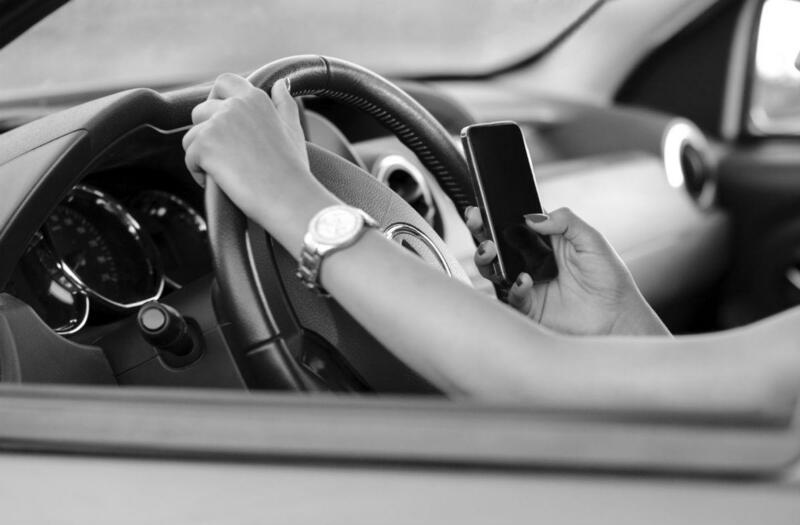 The study was conducted to find out how cell phone activities impact car accident risks; however, it did not consider any difference between handheld and hands-free mobile phones. The study found that dialing or reaching for a cell phone increases accident risks by seven times. Other activities that increase the risk of accidents include distractions outside of the car, eating foods, and trying to reach an item inside the car. Adult drivers are more likely to be involved in car accidents if they dial a cell phone while driving. State laws are in place that prohibit teens from texting and driving. A new device known as a Textalyzer is being touted as a solution for putting a stop to cell phone use while driving. The device would allow police or law enforcement officers to evaluate a driver’s recent cell phone activity at an accident scene or traffic stop. The law enforcement officer would request the cell phone of a driver involved in an accident and use the Textalyzer to access the phone’s operating system. The Textalyzer analyzes recent activity such as emailing, taking photos, and texting. The Textalyzer does not display the content of messages. The purpose of this technology is to help law enforcement officers to determine if the driver was using the cell phone while operating the vehicle. Refusing to submit to the Textalyzer would invite the same consequences as refusing a breathalyzer test. Researchers at the University of Utah said that the findings of the new study do not align with those of earlier studies, because most of the earlier studies concluded that talking on a cell phone increases car accident risks. They warned that the findings of the new study may not be reliable because they used sensors to track driver’s distractions, but sensors cannot capture the reaction of the eyes the way in-car cameras can do. Even though the new study did not associate car accidents with talking on a cell phone, safety experts believe that it is a good idea to avoid any kind of cell phone activity while driving. This will help drivers concentrate more on driving and reduce the likelihood of becoming distracted.